We are proud to present Legacy: Game Boy 25th Anniversary, a collection of 15 songs from 16 talented artists. The idea for this album was founded by WillRock and The Damned, who later passed on the golden chalice to Brandon Strader and Chernabogue. We remixed this music because we love the Game Boy, and video game music. A lot of game developers were inspired by Gunpei Yokoi who was the visionary creator of the Game Boy and ushered in a vast future of handheld gaming. This album is dedicated to him. 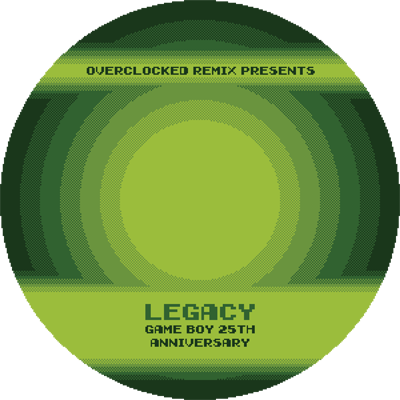 Here for the Game Boy's 25th Anniversary, we are proud to present Legacy, the 49th FREE community arrangement album published by OverClocked ReMix and arranges music from games featured on the Game Boy and Game Boy Color! Legacy features 15 tracks arranged by 16 artists that re-envision original compositions from several composers in a variety of styles. I had this game as a very young kid while the Game Boy and such stuff was still being sold in stores. I remember riding in the car playing Super Mario Land. It was a lot of fun revisiting the music from this game, and bringing a bit of funk to it! The goal at first was to use the Chinese instrumentation, and you can still hear the erhu in there pretty prominently, but that took a back seat to the funk for sure. Showroom Dummy picked the title screen music from Game Boy Batman for People's Remix Compo round 259. It was completely nuts for me to take part in PRC in December 2013, since the Final Fantasy Crystal Clash tournament was ongoing at the same time and I basically had to skip sleep to participate in that already. The thing was, I was inspired by the source to pick up the guitar and learn the riffs, they were easy and fun to play. I offered to collab with my modest playing ability. Then it seemed there would be no entries otherwise, I thought screw it, I'll make a track. I used my FFCC round 2 tune as a template to speed things up and ended up with a remarkably different sounding tune. I also tried to save time by recording the guitar directly to the mic jack of the laptop thinking "it'll be nice and lo-fi!" Garbage. I did feel I got some The Cure influence in there with all the chorus stuff going on. Anyway, I got some good feedback from the compo, mainly about clarity in mixing & arrangement. Then I took the track to the workshop forum and got absolutely amazingly great feedback from TheReverend, which I can't thank for enough (just look at this: http://ocremix.org/forums/showthread.php?p=950191&postcount=2). The overall structure basically needed an additional part to be complete. When the Game Boy 25th Anniversary project was re-started as a quick completion EP production, I thought "this is the opportunity to get that track finished!" I mean, deadlines are great: compo deadlines help me get started on arrangements, and album deadlines make me finish them. Why not combine the two? Genius. Ahem. I added the part TheReverend had suggested, with now much greater recording fidelity. As always, I can't really play the guitar - I only assemble guitar parts, and especially the solo at 1:45-2:19 is spliced up from the best bits of four different takes, making up new phrases from the combinations of what I actually played. Major cheating (at least would be in DoD), but I'm quite proud of it none the less. The old guitars also took a lot of editing for timing & EQ:ing for clarity. I got great steering and feedback from the directors Mr. Strader & Mr. Mourey; Alex suggested asking Tuberz to come on board for some additional guitar: our third (or fourth, if you count Shell Shockers) collab has him delivering some absolutely searing superfuzz soloing at 1:11 & 3:08, plus some padding/doubling work at 1:28-1:44 & 2:19-2:52. Oh and the starting mooing noise is also his playing slowed way down. Big thanks once again to Callum for excellent contributions on a short notice! Again thanks to Rondo and Pleiade for borrowing me recording & guitar equipment; also thanks once again to my fiancée Pirjo, ever my creative advisor, for the best insights and zero-sugared critique, for this and all other music I make. I'm glad I got pretty big thumbs up for this from her. Eino approached me to work on the track and given our excellent track record I happily accepted. I threw some leedle leeds and meedle meeds and it somehow worked out. I love the original DK game for the Game Boy, and I can't remember how many times I beat that game. I also enjoyed a lot its music, which is very catchy. I intended to arrange it and make something that sounds like an action movie score, with percussions, and lots of effects. And I'm quite proud of the result. After one year in my project folder, I decided to revive and improve it. Thanks to Brandon Strader for the feedback, and for this: "I have a particular set of skills, skills that would make me a nightmare for a plumber like you. I don't know where you are, but I will find you, and I will jump on you." This is the best Castlevania soundtrack on the Game Boy, period. I've been meaning to do a remix of this soundtrack for ages and this was the perfect oportunity to do so. I felt there were some retro electronica elements inherent in the original track so it was only natural for me to go that way. Vocal clips provided by Jivemaster and vocoded by yours truly. I am Argle, and Mellotrons are essential for a good OC ReMix. I support this product and/or service. I have a really good memory of Asterix GB, one of the first games whose music attracted me in my childhood. It was a great pleasure to work on it and give tribute to its composer A. J. Gonzalez! This mix is an exotic symphonic arrangement of three major melodies. I wanted to keep the joyful and sunny atmosphere of the game. I thank Joe who recorded for me flute, clarinet and saxophone and gave me some freshness for my mix. 07. Yu-Gi-Oh! Dark Duel Stories - Duel in the Desert! Comments for 07. Yu-Gi-Oh! Dark Duel Stories - Duel in the Desert! Middle-Eastern remix coming your way! This remix was heavily influenced by a lot of the Yu-Gi-Oh! I watched as a kid. To this day, I still like the classic anime, and much more than the later ones. They just don't compare to the storyline genius of the classics. i.e. Bakura stored a portion of his soul into a Millennium Puzzle piece he stole back in the intro-to-Marik episode (WAY long ago, Marik being the second main villain in a line of five), and he actually referenced that action and made use of it as the main plot twist in the final season, acting as the final main villain! Now there's something you just don't see anymore. At first, I just thought about doing the "Level 1 Duel" source, but that just couldn't work it out in my mind without the Shadi theme (even though I have never played this game before)! After about 3 days of remix work, this bad boy was finished. I finally found a use for some of the synth lead and MidEast patches I made on Zebra, haha. A few months later, I went back to refine the bass mixing, which was giving me loads of trouble. I think the toughest part though was maintaining a sense of spatial fullness with the proper reverb and fitting backing instruments, as I kept feeling sections were empty while I was fixing this up. In that time, I also started working on a commercial sound pack of cinematic material made primarily with granular synthesis, and you can hear some of those sounds in the first 7 seconds. Big thanks to Chimpazilla for supplying the awesome drum samples and the Omnisphere Turkish Dulcimer samples for this ReMix, and I hope you find it a unique approach! This is another PRC tune I decided that the Game Boy EP project would motivate me to finish. This comes from the quite recent round number 270. I had won PRC268; I picked a theme from Death Rally for round 269... no mixes seemed to appear. As an incentive of sorts, I promised to make an entry for the next round. Yami won that round with a pretty sweet, mellow electronic tune and chose the title theme from Mega Man II. I started early figuring out a couple of bass lines, and when the finishing rush came about I recall spending about a day recording bass, guitar and clavinet over copypaste drums. It must have taken more than a day surely though, I just don't work that fast. All the feedback from the compo version was citing problematic structure & flow so I worked to fix that, thanks to everyone who commented. Extra cheers to the round winner OneUp, who seems to have been a fan of this one. Post-compo, I added two synth tracks from my Roland SH-201, padding it up a bit + replacing some of the constant guitar noodling. Pretty much everything apart from the drums was assembled from live takes, with lots of the usual editing & patching I do. This was a very fun track to do, kind of back to alt/Finnish rock roots for me. Finishing it in time for the GB EP was a bit exhausting but I'm happy I got it done. Thanks to Brandon & Alex for running the EP & giving direction. Especially thanks to Brandon for the idea to slap some effects on the guitar here and there. And as always, many thanks to my fiancée Pirjo for insight & support! She remarked that this sounds much like our old band Claudius, which was a surprise to me, but it's true. Back to roots indeed. I remember hearing the source track for the first time and thinking... 'This is from a SMURFS game???' All the music from the game is excellent, but this one just has something really special... "dreamy," if you will, about it. I can't really describe it, but such was the basis for the style of our remix. And it was certainly fun collabing with one of my great friends, urdailywater! Hope everyone enjoys! TGH showed me this source a long time ago. A super long time ago. I think a while after that I brought up the idea of collaborating with him on a remix and this is eventually what came to be. I kind of layed out the general structure of the chorus sections, the song in general (instrument choices, composition, etc.) and TGH came in with an overall production overall and finished off the arrangement. It was a great opportunity and he said it best when it showcases both our strengths together in one song. Also, this is the first song I got to use those bell and whistle synths in, so it's holds a special place in my heart musically. Donkey Kong was a major gaming inspiration to me as a child, though in a different way to other retro gamers today. While most would fondly remember playing through his adventures on the SNES, it was the Game Boy titles - the Donkey Kong Land trilogy - that made me see how much Rare was willing to push out of even a black-and-white screen and the Game Boy soundchip. Much like the SNES counterparts, the games were tough and required me to get used to running jumps and chases, precision platforms and the obvious timing to get through all sorts of obstacles including the final showdown with K. Rool. Say what you can about these games, but if I didn't start playing them as a 10-year-old girl, my platforming skills in the years to come wouldn't have been up to scratch. The only source tunes exclusive to the Game Boy were from the first title, in which I decided to go for the sunken ruins music (first heard in 'Kremlantis Chaos' in world 2). We're looking at a civilisation that were pulled under by the waves many years or even centuries ago -- something that was too proud to fall but had to accept its fate and just go along for the ride. Sometimes we have to undergo that same feeling as well -- not wanting to take in the unexpected, we'd have to anyway and smile bravely while doing so. Who knows -- taking the risks may sometimes not be so bad, or maybe make us feel more humble in doing so. Naturally, the game certainly went above my humble expectations and one that I felt happy to tackle. And what's possibly less-humbling is that the Game Boy and myself share birthdays too - who knew? This remix took forever. I spent a couple of years off-and-on trying to figure out exactly what I should do with this track before finally locking it down. Originally, it was supposed to be just a straight up metal combination of the trainer and gym leader battle themes. Over time, I incorporated a bit of synth work, which took the forefront at times. One particular section was eventually worked into the intro. While recording, I wrote in a fadeout, and decided it would be cool to end it on a heroic note, to sort of encapsulate what it's like to have a really intense Pokémon battle and emerge victorious. As much as I love the Oracles, it's about time I arranged something from a different Zelda. I mixed these three sources together as a MIDI about 9 years ago, and I figured I'd take a fresh crack at them in a completely different style: 9-bit chiptune. Wow, what a surprise. Tetris was probably the first game I ever played on a Game Boy and it's basically synonymous with Game Boy. This project needed a Tetris remix, and so I tackled it. Because Brandon made me do it.